I never used to like Batman. There, I’ve said it. In years past, I always preferred the web-slinging exploits of Spiderman, as his stories seemed to focus more on the internal dilemmas of the wall-crawler as much as it did stupid puns and ridiculous villains. In comparison, Batman was a po-faced and uninteresting protagonist whose universe only held appeal to me thanks to his increasing list of enemies, all of whom are afflicted with a psychological flaw that made them far more compelling to me than the man dressing up a bat. However, that all changed within the span of a year: firstly, The Dark Knight stormed cinemas and redefined the superhero movie as we know it, and a hitherto-unknown company by the name of Rocksteady released Batman: Arkham Asylum, and, like The Dark Knight before it, completely altered our perception of licensed superhero games. 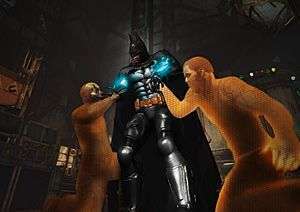 This last year has seen both of those seminal releases receive a sequel; Nolan’s epic finale to his Batman trilogy has recently set cinemas bustling with batfans, and Rocksteady released the open-world bonanza that was Batman: Arkham City. While the jury may be out as to whether these sequels are superior or inferior to their predecessors, with the debate still raging on as we speak, Rocksteady are hard at work on widening their potential audience with a port of their sprawling vigilante simulator to the Wii U in time for the console’s launch. Dubbed the “Armored Edition”, the Wii U counterpart will come with all of the current DLC available on the disc, along with several other notable additions. The first of these is hinted at in the title; Batman and Catwoman are now sporting more protective attire, and can now upgrade their suits to unleash a special ability exclusive to the Wii U. During combat, kinetic energy will be built up, and once the meter is full then our heroes’ suits will be electrically charged, their fists crackling and sparking, and their enemies a lot easier to take down as a result. The demo took us to a conflict involving Penguin’s goons at the museum, and after struggling a little thanks to feeling a little rusty at the controls, the battle was soon over. What I particularly liked about the new ability was that it didn’t feel overpowered, and only fully-charged after I’d already dispatched most of the goons. Instead, I found it served more use as a way to mop up any remaining foes quickly, rather than an instant-win button. 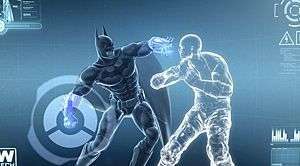 Once the battle had finished, Batman had warped to a moment a little further down the storyline, but it was a section that required the use of several of the caped crusader’s gadgets, and so was an ideal moment to showcase how the Wii U’s controls altered the dynamic of play. The integration is a lot more seamless than many would originally take it for, and it’s one of the few instances where the Wii U’s touch interface is adopted into the game itself. In the Armoured Edition, Wayne’s suit has a new interface on his left arm that instantly connects him to the bat-computer, and so whenever the player uses the touch screen, the TV screen will instead show the Bat making corresponding movements on his bat-computer interface. This also means that swapping gadgets or marking out new destinations on your map may not necessarily pause the game for you, but swapping back to the action is as simple as pressing a single button or just moving your hero. Scanning evidence with the controller is easy and actually feels natural, as you use the gyroscopes to look around in first person mode, and after your first few efforts you’ll know precisely when to look at the TV screen and when to look at the touch screen. Picking gadgets to hot-swap to is also as simple as dragging them to the corresponding controls, although it struck me after the demo that this was entirely unnecessary and a slower process than on consoles, which allowed the player to access all their gadgets at any one time, rather than forcing them to mess about in menus beforehand. Admittedly, this was the only example I found where a new feature felt shoehorned rather than a useful alternative to the standard layout on previous versions. One gadget that is vastly improved by the addition of the touch-screen is the explosive gel, as upon holding the detonator, Bruce can choose between each application of gel via the touch screen, allowing for separate detonation, or explode them all at once as normal. The ability to separate the explosions is available in previous versions, but the process is streamlined and as such much quicker when playing on a Wii U. The remote Batarang, however, may cause varied results for some, as throwing it will show you the projectile’s view on the touch screen, where it can then be guided by the gyroscopes built into the controller. This may come across as confusing at first and takes a couple of tries to accustom yourself to, but it’s a neat way to allow players to exert more precise control if need be. What may convert some potential players is that if you don’t want to, then you don’t have to use the motion controls or the touch screen. 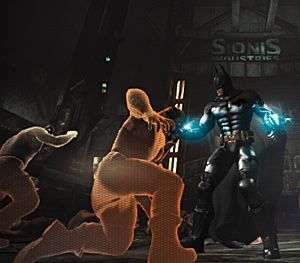 You’ll still be required to look at the latter when operating some of the gadgets, but both touch and motion controls can be completely circumvented, so players can still guide Batarangs with the control sticks or activate the new armour abilities by clicking said analogues, rather than pressing on the touch screen. These additions are essentially optional ways to play, so you can employ them as much or as little as you want, and for me, that’s a big selling point to anyone who still hasn’t played the game but doesn’t want to use the new control methods. However, when enquiring as to whether the game supported the use of the pro-pad, thus circumventing the standard controller entirely and allowing it to be played exactly like the previous iterations of Arkham City, I was informed that they haven’t yet confirmed its presence or lack thereof. If you’ve yet to delve into the world of Arkham, then the Armoured Edition will be your best bet come the launch of the Wii U; it contains all the previous content as well as the exclusive armour abilities, and utilises the capabilities of the console in unique ways that feel well-implemented more often than not. For anyone else, unless you’re the type of man so obsessed with Batman that you’ve made it your mission to buy every single version of the game available, then there’s probably not going to be enough here to convince you to hand over the contents of your wallet yet again. The new additions are well-thought out and provide an alternative avenue of play, but they’re not going to be enough to re-entice anyone who has already seen all Arkham City has to offer.